When I started thinking about my daily rituals this week, I immediately thought I didn't have any. I spend so much time actively looking after my kids - cooking for them, clearing up after them, helping with homework, finding pieces of LEGO and Playmobil, taking them to and from school and activities - that I would honestly have said that there was no time for a daily ritual of my own. Well, I do insist on a morning cup of coffee, but even that is gulped between spreading Nutella on toast and making the snacks for school. 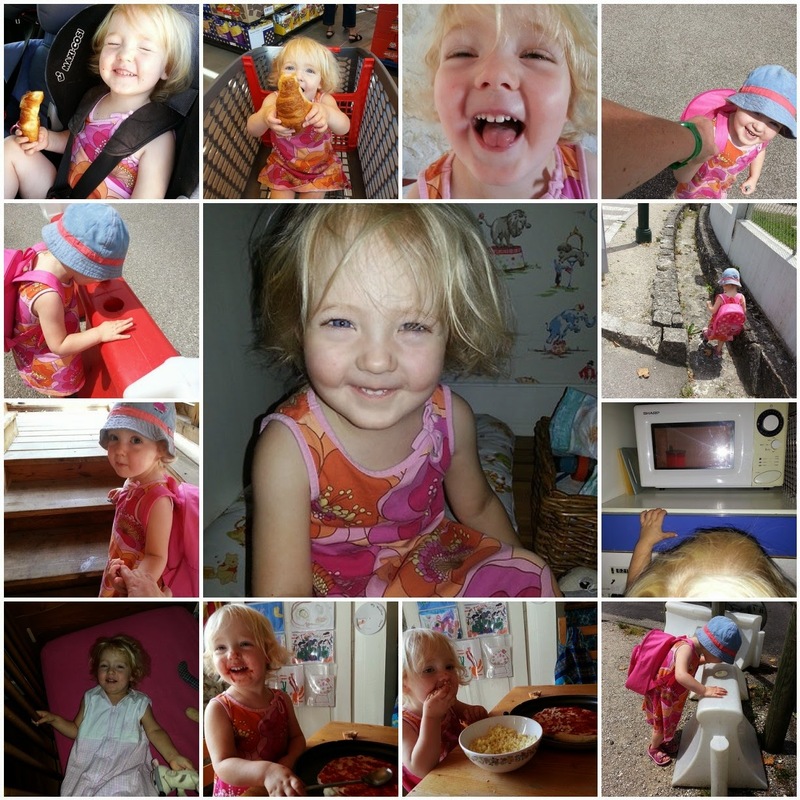 Then, last Friday, I took the time to take some photos of me and my littlest spending our day together. I realised that our day together has a lot of structure and that these "rituals" are very important to my littlest girl. This is our typical Friday. Let me talk you through it. 1. I go get Elsie from her bed. I am greeted with a big smile and often we have the following conversation - "Where's Elsie?" - silence - "Oh there she is!" (giggling) followed by, "Hello, Mummy!" "Are you feeling cheeky today?" (grabbing her cheek) "Leth!" 2. Elsie has a cup of milk every morning. It has to go in the "round and round" and she has to be picked up to watch it do its round and round thing. When it pings, she opens the door, takes the cup out, places it out of the way, then closes the door. She picks the cup up, I put her on the floor. I ask, "What do you have to do?" She answers, "Close it, shake it, open it, drink it." 3. Before we go anywhere she gets her sandals and while I'm putting on the first one, she grabs the second and hides it behind her back. It's brought out with a flourish and much giggling. And an explanation for me ("Sandal, hiding, back, mummy! "), in case I thought it was real magic. 4. She always gets a croissant to eat as we go around the supermarket. 5. When we get back to the house in the car, by the time I get to her door to get her out, her eyes are squeezed tight shut. In case I am in any doubt she tells me she is "sleeping" and stays that way, big grin on her face until I tickle her. 6. We walk to playgroup together. She holds my hand. 7. Until she gets to the ditch. Then she has to walk in the ditch. Right to the end. 8. She stops to look at the water in the barrier. In each and every individual section of the barrier, I should mention. 9. At playgroup we count the stairs as we walk up them together. There are three sections of 6 stairs each. We have been doing this for nigh on a year. Today she said, "No. My count them. Three, six, three, six." 10. Every Friday night since she could sit in her high chair she has made her own pizza for pizza night with her siblings. More often than not, this involves eating as much topping as she can get away with before it goes on the pizza. These little rituals sometimes take a lot of patience. I would not like to calculate how much time we have spent going through the rigmarole of heating up her milk. I'd probably find it quite depressing. But the fact that these rituals are so important to her makes them worth doing. If we have to miss one, maybe because we're in a rush to be somewhere, I can't stand to see her brave but disappointed face. And like other rituals that seemed so all consuming (singing Incy Wincy Spider 400 times a day, for example) I'm aware that these too are fleeting, to be replaced by others and then forgotten by her, remaining important in my own mind only, when she was my littlest girl, and these things were everything to her.